If you ask me what is my number 1 choice regular model will preserve value in the future? My answer is always no.114 JSDF, but it no longer possible gets it locally in Malaysia. If you want to know more about JSDF, I have some write-up in my earlier posts. Let’s buy something possible today will make you richer in the future. I will recommend you non-Japanese models will have better market value in the future. Tomica Ferrari, Volkswagen and Rolls-Royce explained. 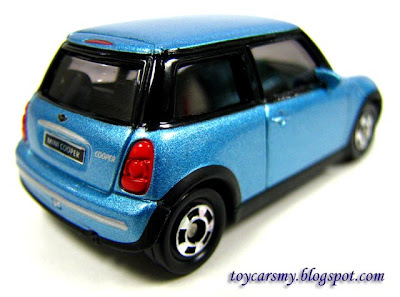 My 1st runner-up choice is no.43 Mini Cooper light blue colour, follow by no.15 Hummer H2. I dropped H2 due to recent reproduction model with awful quality. To prove my point, you can examine those H2 with “Takaratomy” logo yourself. Here are my views on Mini, you may not fully agree with me. 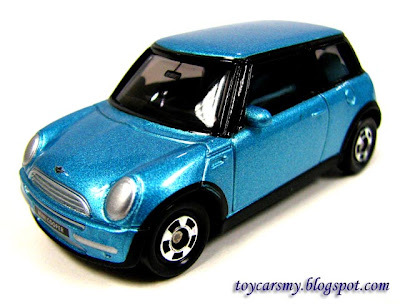 You can not deny this is an all time favorite model, I have missed the No.88 Classic Mini in the beginning of 2000s, which it worth not less than USD15.00 if you purchase from Ebay and this hasn’t calculate in shipment. I believed, when No.43 becomes discontinued, its market value wills shoot-up just like its predecessor. - The only regular model has side mirrors. - Has a metal base, and it is heavy. I have not come across any others have metal platform too. - The model number is printed instead of embedded on the base. 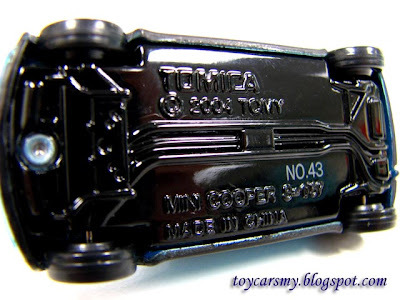 However, the only downside is the wheels; it is not with the Tomica racing wheels, otherwise, it will looks more sporty. But, I’m not too worried on that, because I could change it myself. Yeap, like the older Skyline R32 has side mirror. But it is the only current regular line-up has side mirror. Do it missed out other?